The NuGen Partnership is excited to announce its initial public offering of NuGen genetics on April 18, 2015! This is a once in a lifetime opportunity to invest in quality and be a part of Santa Gertrudis history. Click here for RESERVATIONS. Everyone is invited to preview the cattle Friday and Saturday at MC Ranch. 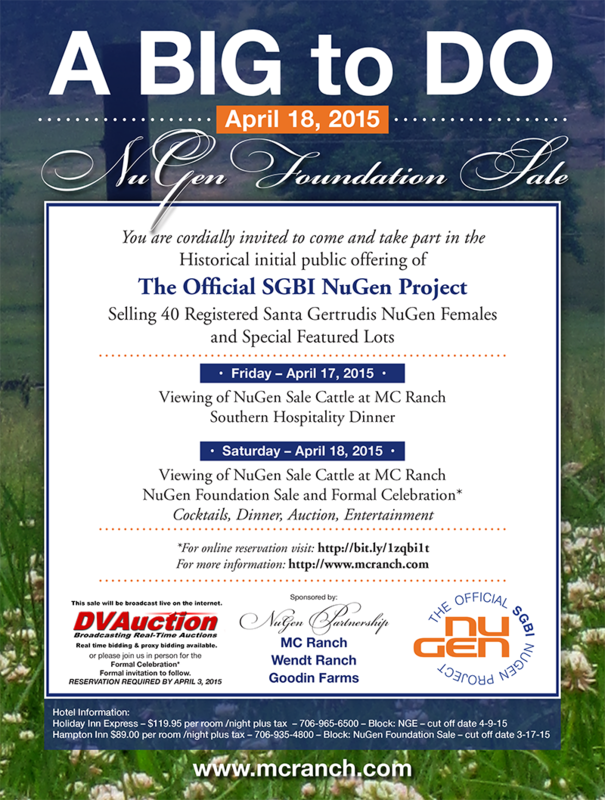 The NuGen Foundation Sale and Celebration will be held at the Ringgold Depot in downtown Ringgold, GA. Click here to make your Reservations to the NuGen Foundation Sale and Celebration or call MC Ranch. Video auction provided by DVAuction. Preview of the NuGen Foundation Sale cattle begins Friday at 2:00 p.m. Private viewings are available upon request. The NuGen Partners will provide a Southern Hospitality dinner at MC Ranch on Friday at 6:30 p.m. Viewing of NuGen Foundation Sale cattle from 8:00 a.m. until 4:00 p.m. The NuGen Foundation Sale and Celebration begins with cocktail hour at 6:30 p.m.